I’VE HEARD THAT FOLLOWING AN ULTRAMARATHON, a runner can experience a letdown. No such problem here. I’m enjoying the recovery period after a summer of long mileage and many hours of training. And this was not a “once per lifetime” event for me, as another 50-mile finisher told me it was for him. Assuming I stay fit and healthy, there will be more ultras to come, and more goals to work toward. For now, however, I’ve basked in a week of relaxation and reflected on how the race went and what I learned. Biggest lesson learned? I really can run a 50 mile race! And with two trail ultras now under my belt, I know that I like them better than road marathons. They are easier on the body and the aid stations are much better. Plus the other runners are more friendly. Just about every time I passed people on the trail, I got words of encouragement from them. I even had some conversations, like on group runs. So I said to her, if we’re going to keep meeting like this, we should at least have a photo. One fellow 50-miler named Carolyn both inspired and confounded me all during the race. I met her a couple of miles in, and learned that she’d run a double marathon earlier in the year. I ran ahead, but she caught up at the aid station and went ahead until near the halfway point where, again, we met at the aid station (see photo). At that point I picked up the pace, and figured I’d seen the last of her. And so it proved – until the final aid station at mile 45. As I walked away, finishing my drink, she motored on past me. “Oh, hi!” she said, before disappearing into the woods. Huh? How’d she do that? However it happened, it just wouldn’t do. I was tired and sore, and walking felt darn good, but I kicked it in again, and caught up and passed her for the final time with about two miles to go. I didn’t see her at the finish, which was too bad – I wanted to thank her for inspiring me to finish strong. This worked wonderfully until those final few miles, which seem to take forever no matter what race I’m in. The campground music I finally heard was like the choir of the angels. Nice that they sing Led Zeppelin up there. As for the rest of the race plan, here’s a quick summary of how things worked out – or didn’t work so well, which as a QA professional I have labeled Opportunities for Improvement (OFI). 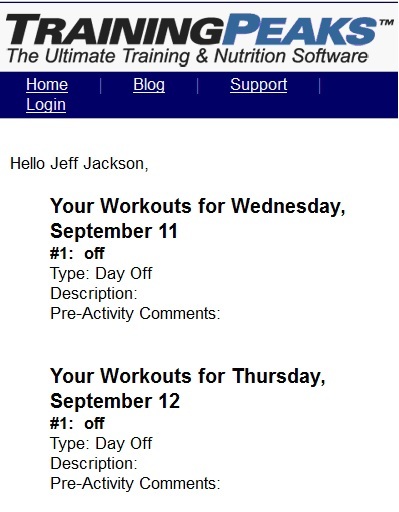 Training plan: Success. The “bricks” (long runs followed by long bike rides) gave me the cardio function and leg strength to complete the 50 miles. Gear: The running backpack was fantastic. I hardly felt it, and it was handy having the camera in a front pocket. 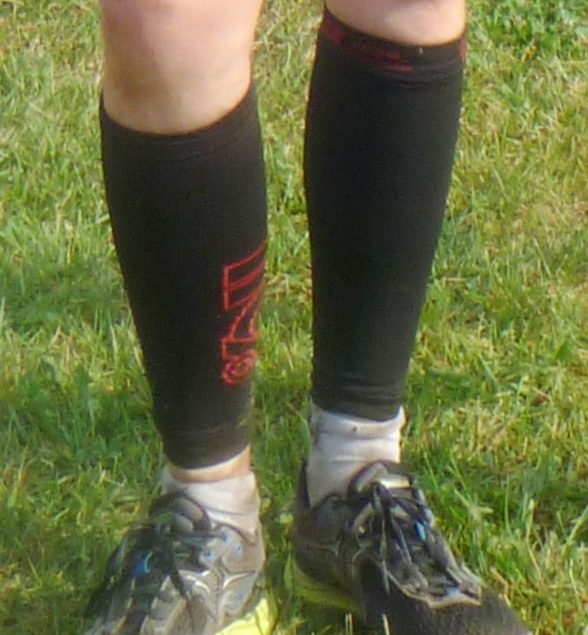 The compression sleeves (pictured here) helped with circulation – no leg swelling – and protected my legs against branches and thorns. They may also have prevented more of whatever rash I ended up with on my thighs. Fueling and “elimination”: Gratifyingly, I had no problems with either end of my digestive tract. The pre-race carbo-loading must have done the trick, because I had plenty of energy throughout. I also made sure to have some salt at each aid station. Lubrication. I applied Vaseline to certain sensitive areas before the race, but during the final loop I had some pretty bad chafing. Next time I’ll be sure to apply more at regular intervals. Crossing the finish line is not actually the end of the race plan. I needed to keep walking, eating, and drinking for at least a half hour. 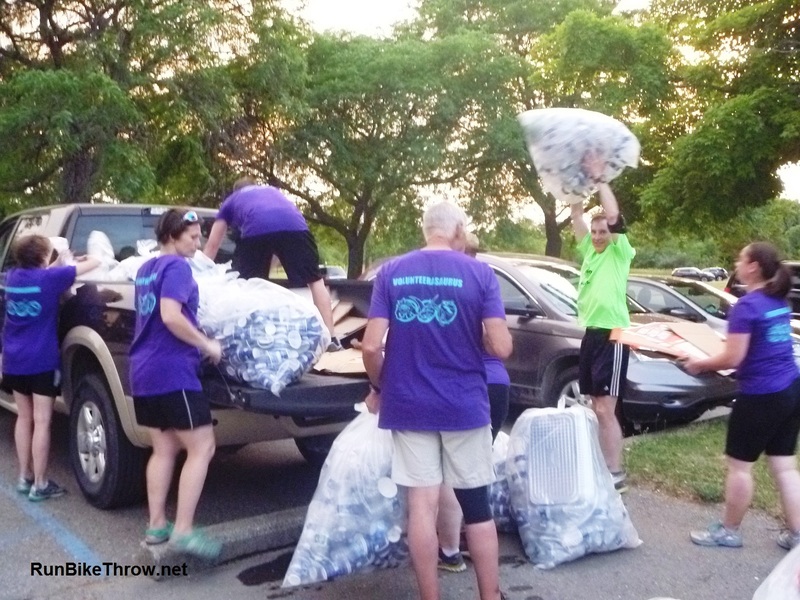 Failing to do so meant an experience much like after the Ann Arbor Marathon last year – wooziness followed by a seat in the shade with a bag of ice on my head, being watched over by concerned race organizers. Fortunately, some salted potatoes and lemonade brought me round. Finally, I know some of you are wondering if I was able to complete the Weekend Challenge again this year, including some “natural miles”. First of all, I have no idea what you’re talking about. Second, I skipped it – too sore. Maybe next year. Next on my race calendar are my standard fall short events – Halloween races, turkey trots, and the Holiday Hustle. No sense of urgency like I had last year, since I’ve met my goal of a 5K under 20:00. But that’s okay. Next big decision: whether to stick to my regular schedule of races next spring, or try for a spring ultra. Sure, why not? This entry was posted in Run Woodstock - 2012 & Beyond, Running & Cycling and tagged 50, 50 miles, bricks, fitness, lessons learned, recovery, Run Woodstock, Running, training, ultramarathon. Bookmark the permalink. Great post! 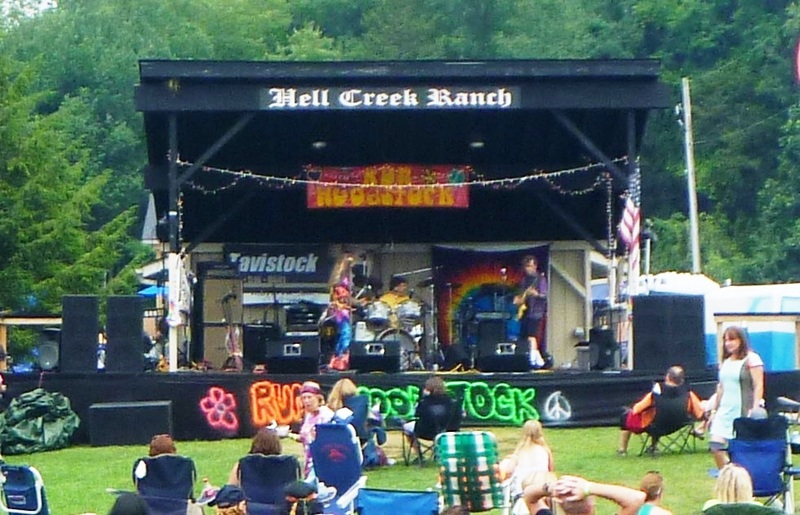 I’m still catching up with my blog and will be posting my Woodstock recap next week. Looking forward to hearing about your experience. Which race did you run there?